So I've been doing a lot of marketing etc recently, first of all to create a very different and unique logo which represents my business and second of all to create an app for free, a good app, with push notifications (harder than it sounds). It isn't a standalone but it is as close as you get for free with push notications! It's www.yapp.us if anyone wants to create one! You have some very nice photos on your website. I hope someday to be as good a person as my dogs think I am. The logo looks like you put a lot of work and thought into it. As art I think it works. As a logo though I'm not too sure. Here is why - the level of detail seems pretty intricate (read busy) and the font isn't very easy to read at the bottom. 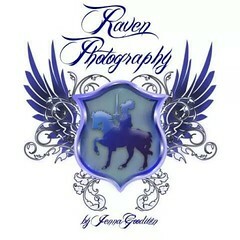 I believe your intent is to tie together the concept of your company/studio name of Raven Photography by using the wings and that you shoot equestrian stuff by putting the horse and rider on the shield. Not a bad thought but adding all the scroll work on top of the wings just makes the whole thing look too busy to me. It distracted me from the horse and rider as I tried to determine if there was scroll work on top of the wings or if it was part of the wing design itself. I'm not sure the rider on the horse helps indicate the equestrian aspect of your intended clientele. I'm don't know what to suggest to help change that. As to the font choice - it is an elegant font; however, it is extremely difficult to read your last name. I'm not sure having both your studio name and actual name incorporated into the logo works. Do you want your name or your studio name to be the more recognizable one that people look up when they are trying to find an equestrian photographer? I am not a graphic designer. I am an amateur photographer and really have no need for a logo but I like to think about it now and then and I have done some small amount of research on designing logos. Everything I have read or reviewed says simple and easily usable/reproducible across multiple media platforms is the way to go for a logo. As I have considered what I would want in a logo I always find myself asking, "How easy would it be to embroider and what would it look like embroidered on a shirt." I don't know why but somehow that helps me keep things simple. Maybe one of the Camel's resident graphic designers, Tatuduck, would have some helpful suggestions if he is inclined to offer them. Just some thoughts offered in Camel friendship. How are you going to use the logo (website, watermark, business cards, printed products)? As nice as script fonts are, they are hard to read. Did you do any font and color studies prior to your finish product? It is a awesome logo and obvious that you put a lot of time and effort into this. Knowing how you plan on using the logo will help a lot.